STOP HS2 | ‘One North’ Report is an admission HS2 won’t regenerate the North. ‘One North’ Report is an admission HS2 won’t regenerate the North. Today, five Northern City Councils (Liverpool, Manchester, Sheffield, Leeds and Newcastle) have published the ‘One North’ report in response to Sir David Higgins’ call for transport proposals so that the north can ‘get the best out of HS2’. The report represents a massive shift in spin in the run-up to the General Election, as while it has been claimed that HS2 would ‘rebalance the economy’ for the last four years, now it is claimed that actually spending money in the North of England will create a ‘Northern Powerhouse’, with the claim that improved East-West links give the same benefits of HS2 for fraction of the cost. Unlike the £50bn earmarked for HS2, the £10-15 billion One North package calls for investment in an integrated multi-modal transport, in roads, inter-city rail, regional rail and digital infrastructure. 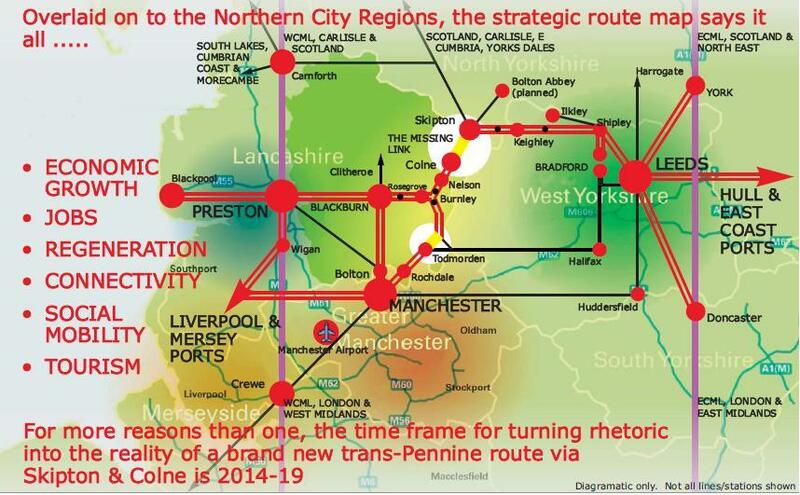 As part of the proposed £15bn spend, £5bn has been earmarked to provide a new Trans-Pennine route, despite the fact that two new Trans-Pennine routes could be created for about a tenth of the cost by restoring 27 miles consisting of the Skipton-Colne and Woodhead lines. This year, a report from ARUP showed the 11 mile Skipton-Colne route could be reopened with four tracks for just £110m, while the Northern Way previously calculated reopening the Woodhead Line would be worth £10bn to the national economy. The One North report suggests the speed of a new Trans-Pennine route would be 125mph, the same as the current West Coast Mail Line, half the design speed of HS2. HS3: Still no plan, no route and no timescale, but a £65bn budget. I am Derek Jennings, Chairman of SELRAP (Skipton East Lancashire Rail Action Partnership) the group that has been trying (for the past 12 years) to re-open the Colne to Skipton line which you mention in your report. May I start by correcting a statement you make…..”you state the ARUP report says ROUTE COULD BE RE-OPENED WITH 4 TRACKS”. Sorry but that is wrong…….only 2 tracks…..there is NOT and never will be room for 4 tracks on the old track bed. We have had a great relationship with ARUP who have produced TWO reports for us…..go to http://www.selrap.org.uk to read them. Yes, if our 11and a half miles of railway were to be re-opened it would create a NEW Cross Pennine route from major destinations and ports on the West Coast (Liverpool etc) right across to the East Coast ports (Hull and Humberside etc) at a fraction of the costs being quoted for an HS3 line. (Though Colne to Skipton could form PART of an HS3) Not to mention all the advantages and benefits to the ‘deprived areas’ of East Lancashire and neighbouring Craven District (North Yorkshire) crying out for a decent connecting rail service. Plus the fact that this through route is of the very lowest gradients with NO major tunnels or bridges to contend with. The present road system between East Lancashire and North Yorkshire is continuously clogged up with traffic jams and other delays making the WANT for a better transport system between the two counties desperate! SELRAP has been told many times that to progress our campaign we have to get the ‘local authorities’ involved……Lancashire and North Yorkshire……..and whilst we are making some progress with Lancashire we have yet to persuade North Yorkshire to join us (and other bodies) in our PROJECT DEVELOPMENT GROUP to take our aspirations further to DfT and National Government. At the moment we are trying to get funding from our own members and friends to do a GRIP3 (Network Rail) study along the defunct track-bed and see where we go from there. I DO wish that Local and National Government would take our campaign seriously and give us some progress so that re-opening Colne to Skipton would be a major landmark across the North of England. Who can persuade Labour to change the national priorities in favour of One North or similar instead of HS2 Phase 1. The promotion of One North for tactical voting along the Phase 1 route for Labour will make the change to reduce the debt build up in the next and later Parliaments as twice £15B ie £30B drops to £15B and possibly further if Phase 2 is delayed. Developments in cities and towns can continue without HS2 it is not the great stimulant being put forward currently. Look at Leeds station or any station such as Paddington and the station does not make the area develop but land and planning permissions. Neither need the Hybrid Bill. Change the Labour Manifesto for tactical voting in the Marginals and against Coalition MPs and the UK can find a more balanced Government living with the realistic constraints. It is good to see Skipton (pie capital of Yorkshire) back where it belongs – at the centre of the universe. As probably the only living witness waving at a ‘named’ Black 5 passing the engine shed there, I know what it is like to wait weeks for a Jubilee, only to have to make do with a blinkered Scot. Needless to say, years later, rushing to Windsor Castle down an otherwise empty street for another Jubilee – late again – I don’t expect the occupants of HRH 1 remember waving to me and the missus, waving back, of course. As with the Beeching cloud, HS2 will have a silver lining – for the few who are in a position to capitalise on it (grabbing an advantage from blight existing long before Raleigh brought in the potato), but for 1.4 billion rail journeys per year (out of 1.5 billion total), ultra high speed is not the issue. Ok, then just get the railway to run as in Switzerland – for the people and not for politicians (hoping they have resolved the ludicrous ticketing laws! ).